London is a city aware of importance of cleanliness and is quite used to availing one off house cleaning services. 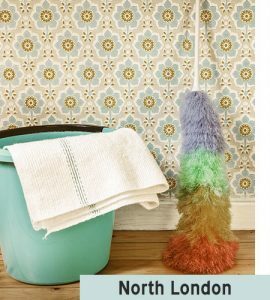 Hiring professionals to clean homes is a common practice especially in North London. We understand that most people have a career to manage and managing a household naturally takes a backseat. Working individuals also desire a perfectly welcoming home when they get back tired after a long day at work. Hiring a professional to clean your home while you are busy climbing the corporate ladder, seems to be a pleasing and reasonable solution to such woes. This also helps you in concentrating at one thing at a time. We have specially designed our rates on an hourly basis so that it is easier for our clients to plan out their one off cleaning tasks and their work schedules. Our list of services vary from a routine and regular cleaning service to something that might be customized and last a few days. It is only after we know the requirements of the customer that we design an individual cleaning plan for them. We also advise our clients on how long it would approximately take to perform the cleaning activity as stated by them so that they can schedule activities conveniently. Our house cleaners are professionally trained and fully equipped with the best of the cleaning devices. They are also completely insured against accidents and injuries while they are at work. Hiring a professional to do your cleaning activities should always be preferred over hiring a cleaning individual to do your daily chores. This is because a company is more reliable with such things than an individual. Moreover, in case of any kind of loss, the company can be held responsible and pulled to the court but in case of an individual, such proceedings become difficult.